This book is about the trials and tribulations that we all go through in life. But when we have an anchor in God, upon whom we trust and depend We can make it. In this book you'll experience three stages of our lives; the accident, flirting with death, and spiritual growth that came from it. Robert a manly man muscular stands about 6"4, with broad shoulders, bald with a goatee and very well groomed. Being an entrepreneur the president of his own organization a Christian motorcycle Ministry, "The Heavenly Riders." A talented and skillful young man with many different crafts Like the old clich say's "Jack of all trades master of none." A very gentle man with a kind heart who will give you the shirt off of his back He possesses only one flaw the act of unforgiveness Robert experiences a trip to Hell which changes his attitude. I was born in the small town of Crawfordville Ark. Born at home with the aide of a midwife on a cotton farm . My family chopped and picked cotton for a living. My mother and father separated. We moved around for many years until finally residing in Little Rock Ark. I attend schools in the Pulaski county area. I also attended Horace Mann and Parkview. I dropped out in the tenth grade. I attended adult school in the daytime hours and work nights. Later a teen mom at the age of nineteen giving birth to a handsome son Andrew and four years later a beautiful daughter Jannette. Formerly a single parent who worked two jobs to make ends meet. An old class mate and I were reintroduced and later married. We are the proud grandparents of six. I've been employee at Arkansas Children's Hospital for the past sixteen years. 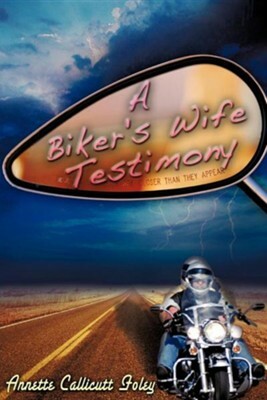 I'm the author/artist and I want to review A Biker's Wife Testimony.